Lindsey will be graduating with his bachelor’s degree in recreation professions at 2 p.m. on Dec. 15 at the SIU Arena. It’s a proud and exciting moment for the Louisiana native – one that puts him on the road to a career as a coach, just like his father before him. 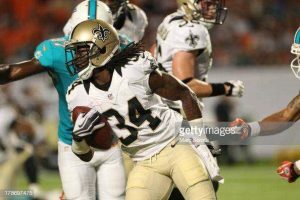 As a wide receiver and defensive back at Scotlandville Magnet High School in Baton Rouge, Louisiana, Lindsey twice won all-district honors and was a two-time member of the All-Metro Baton Rouge first team. On the offensive side, he gained more than 1,100 yards and racked up some impressive defense statistics. 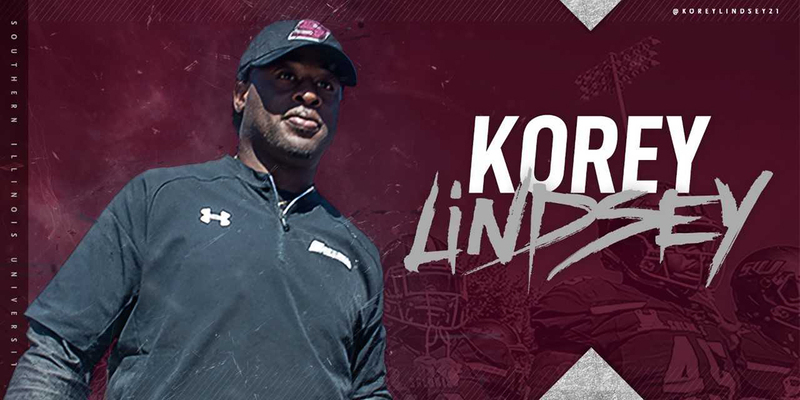 Recruited by Jerry Kill, former coach and now interim athletic director and special assistant to the chancellor, Lindsey joined the Salukis in 2008. He admits to being a huge Louisiana State University fan, but when he visited SIU, he fell in love. He played in 36 straight games for SIU on the way to becoming one of the university’s most decorated players. 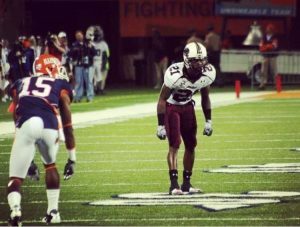 He won back-to-back Associated Press First Team All-American honors along with numerous other national and conference accolades and is one of the most highly ranked Salukis ever in terms of interceptions, pass breakups and other feats on the field. Lindsey’s accomplishments didn’t go unnoticed. He was drafted in the seventh round by the Cincinnati Bengals as the 207th overall pick during the 2011 National Football League Draft. Putting on that orange, black and white uniform and walking out onto the field to join his team in action against the Detroit Lions in his very first professional game is a memory etched deep in his mind. 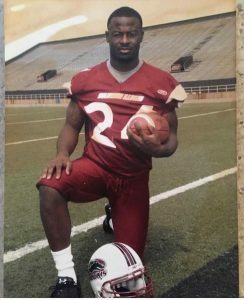 After enjoying an amazing few years in the NFL, where he also tested his skills with the Arizona Cardinals, Indianapolis Colts, Jacksonville Jaguars, Washington Redskins and Dallas Cowboys, Lindsey decided it was time to refocus on his other goal and dream. In short order, he returned to SIU and says a warm welcome awaited him. He resumed classes and found supportive faculty and staff eager to help. In particular, he said Tina Colson, senior lecturer and recreation professions program director, has been “extremely encouraging and supportive – the best ever” and his adviser and others in the College of Education and Human Services have also been helpful. Lindsey was also able to snag an internship with Saluki Athletics, working with Gaizka Crowley, director of recruiting and player personnel for SIU football. 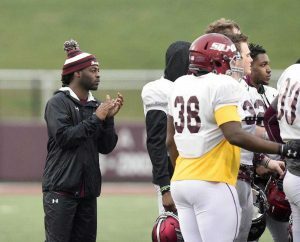 He appreciates being able to work with Crowley, as well as with head Coach Nick Hill and safeties coach Marty Rodgers, both of whom were teammates when Lindsey played for the Salukis. In addition to the practical experience he’s obtained through the internship, he also writes a weekly reflection paper on his experiences for faculty review. Returning to the world of academia has not been without its challenges, Lindsey said. In addition to the obvious difficulty of returning to the classroom after several years away, Lindsey also has a lot more responsibilities to juggle these days. That includes daughters Kennedi, 10, and Sevyn, 2, as well as son, Harlem, 7. While the past year hasn’t been easy, Lindsey has made it work, relying on his faith, sacrifice and commitment. He said he’s also matured. “You have to have self-determination and will and the vision of things in the future as you want them to be, then work hard to make that vision become reality,” he said. When Lindsey’s fiancée, Tiana Brown, and parents Lisa Lindsey and Keith Woods see him walk across the stage during commencement, Korey is determined it won’t be the last time in the foreseeable future they see him in the college limelight. Lindsey plans to forge his education and experience into a college football coaching career. He’s initially looking for an assistant position, perhaps as cornerbacks coach, but his long-term goal is a head football coaching job.